Would you or your loved one like a Catholic funeral? 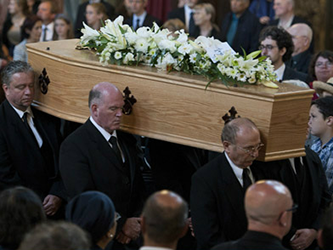 The Catholic Church seeks to accompany it’s members with prayer and pastoral care during any times of sickness, through any final illness, to the time of death and beyond. Please read the information below and then contact the parish. After the death of your loved one please contact the priest who will discuss and guide you in all aspects of the funeral liturgy to take place in church, at the crematorium or at the graveside. You can discuss whether you want to arrange a Requiem Mass or a Funeral Service to suit your families needs. An organist will be booked for the funeral to provide hymns and instrumental music to help lift heart and mind to God during this time of need.